So earlier today I settled in with Mass Effect 3. On the Xbox 360. Popped my disc in, booted it up, went to import my character from the last two games (which I'd preserved over four separate consoles). At first, it went well! There he was, with his decisions and class choices in place. But then I got an error. And it was very disappointing. Seems my character's face couldn't be imported. That's OK, I thought, must be a hiccup because the game wasn't technically out yet, maybe a switch at BioWare hadn't been flipped yet. The game is now out. And whatever swtich needs to be flipped, or fixed, it still isn't working. We're getting emails from readers, and there's already a massive thread on BioWare's forums, saying the same thing. That or the import is working, but producing faces that look nothing like the original. Note that we don't yet know if this is affecting everyone, everyone who has a save from both games, or just some people. 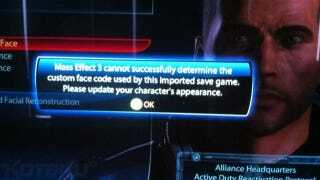 It seems the error is popping up for people who built a face for Mass Effect 1, carried it unchanged into Mass Effect 2 and are now trying to bring it into Mass Effect 3. Which will be only the series' longest and most devoted fans. At least, those who aren't playing the game on PS3 (which obviously doesn't have Mass Effect 1, and so shouldn't be affected). We're hearing that PS3 players are experiencing the same issue. We're keeping an eye on the issue (which EA seems to already know about), and will update with more info when it comes to hand. For now, I'd say...look, if you can hold out on starting the game, and care that much about your character (which if you're being affected by this you probably are! ), then do it. OK, that's one error down. Now onto the next one. Anyone who kept their Mass Effect 2 saves on the Cloud (and this is the Xbox 360 version specifically we're talking about here), you can't import them from there. You need to import it from a HDD. With a catch: you need to re-download it to the HDD it was originally created on. Hope you haven't bought a new Xbox in the last two years!